I've been spending most of my time in Guyana on the coast, enjoying the Caribbean lifestyle, especially Caribbean food and Caribbean music (I love the soca aerobics class at Space Gym! ), but I thought it was about time to take a trip into the Amazon rainforest. I am, after all, in South America. And the one thing that I knew I had wanted to see while in Guyana was the famous Kaieteur Falls, buried deep in the Potaro-Siparuni Region 8. Kaieteur is one of Guyana's proudest gems. Located in Kaieteur National Park, the country's first and only national park so far, the waterfall at Kaieteur is twice the height of Victoria Falls (where I once went for a little swim) and four times higher than Niagara Falls. It is, as every Guyanese person will happily tell you as a fact that they've memorized, the widest single drop waterfall in the world. It is also one of the most powerful waterfalls. There is also a persistent belief among Guyanese folks that Pierre and Margaret Trudeau had their honeymoon in Kaieteur National Park, and that Canada's current prime minister Justin Trudeau was conceived there. This may or may not be true, but I know I want to believe it. People have called for Guyana to invite Prime Minister Justin Trudeau to come visit his "place of origin" in Guyana. Interestingly, many of the Guyanese colleagues I've been talking to have never actually visited Kaieteur themselves. For one thing, I imagine it's different when you live there with your busy life, like how I haven't done a tour of the Parliament building in Ottawa since I was a kid, and the only times I've been there was for business reasons. And secondly, the trip is quite expensive, probably more expensive than the average working class person would feel reasonable to spend for a trip. But I really wanted to go. We started our journey at the Air Services hangar at Ogle Airport, where we loaded into a tiny propeller plane that can seat about a dozen people, tighty, packt like sardines in a crushed tin box. As an Arctic lawyer, I've flown in tons of small prop planes before, sometimes in terrible weather conditions, but this was smaller than those planes, I suppose because it only transported people and not a community's worth of groceries and a court party in addition. This meant I got to sit right behind the pilot and enjoy his view of the front of the plane!! I was treated to a lovely aerial view of Guyana. I watched as the communities gave way to farm fields which then gave way to the vast Amazon rainforest that makes up a big chunk of the country. I was amazed to see how far the endless canopy of treetops extended, like a giant broccoli crown. 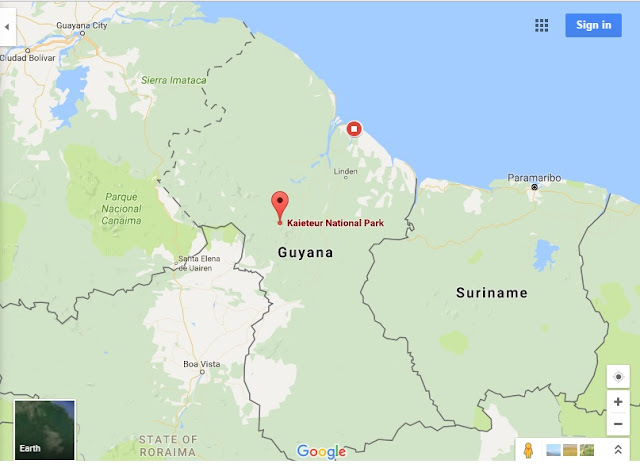 It helped me realize just how much of Guyana is pristine wilderness - like much of Canada's north - which is one of the things that made me want to come to Guyana in the first place. This is what I love and where I love to be: in the middle of nature, far from any signs of city life. At least until the mining companies come in. And then I fell asleep, which is why prime airplane seats are generally wasted on me. I woke up when my travel companion nudged me just as we flew over Kaieteur. The landscape was still rainforest, but had changed dramatically, as we were surrounded by chains of mountains and daunting cliffs with brown rivers cutting through them. The plane touched down on a tiny airstrip in a small opening in the jungle which was, along with a small cabin that had washrooms and a waiting room, the only visible man-made structure that I could see in the area. We were greeted by two Amerindian guides who took us through the rainforest, over and under and through the huge boulders that form the enormous and ancient precambrian Guiana Shield. Unlike the lady passenger who for some reason decided to wear sandals on this trip, I was thrilled to have a chance to do a bit of hiking, but it made me wish I hadn't gone to Space Gym the previous day to do a hundred squats and lunges. My legs complained, even though it wasn't a particularly challenging hike (unless you wore sandals). Our guides pointed out various plants along the way. Many of them were carnivorous plants that fed on mosquitos and other insects, which is why we weren't being pestered by them at all during our walk. I considered stealing some to bring back to my mosquito-ridden apartment. Seriously considered it. Did not, because we aren't supposed to alter the environment while in the national park. But what an idea. Parts of our hike took us over cement bars propped over deep crevices and sometimes into them. My guide assured me that there were no jaguars around during the day, and that they were generally shy about people. Suddenly the hiking trail spit us out into Johnson's View, the first viewing point of the waterfalls. I like the fact that the trails and lookout points here do not have guard rails. They do make the heights of the cliffs seem a lot scarier, but as long as you keep a sensible head and don't take risks in stepping too close to the edge, you can enjoy an unspoiled view of the waterfalls, and the river rapids. After taking a large number of selfies, we then continued through the trail to arrive at the second lookout, slightly closer to the falls, called Boy Scouts View, for the Guyanese Boy Scouts that used to camp here. Which by the way, sounds like an awesome camping trip. I don't remember much of what I did during my short time in Girl Guides, but I seem to recall sewing buttons. Finally, a little further down the trail, we arrived at the third lookout point, which our guide called Rainbow View. Indeed, there was a rainbow arching over the falls. It was so damn magical. After I had my fill of taking selfies from every angle imaginable, I just stood and admired the view of Kaieteur. Waterfalls are such magnificent things. As I had mentioned before, Kaiteur is one of the world's most powerful waterfalls, propelling such a tremendous amount of water down the towering ledge with such a tremendous amount of force. To me, it looked like sorcery to watch the river water break into white streaks resembling dynamic cave stalactites rushing down, as some of the water turns into mist and the rest of the water crashes into the bottom with a spectacular roar. I was mesmerized, and my guide had to remind us that our plane was waiting back at the airstrip. On the plane ride back, one of the passengers got to ride up front with the pilot. I was mildly jealous, but the reality is I would have slept through it all anyway.